Greenwich is a world heritage site with a wonderful mix of the historical, the maritime and the scientific. On Friday last week we went to visit the National Maritime Museum in the Royal Park in Greenwich. 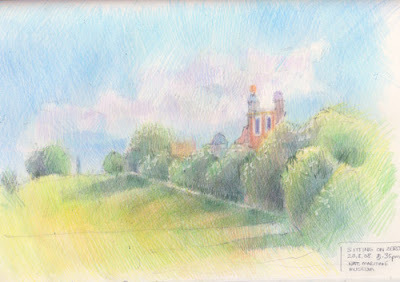 After the museum closed, I sat behind the Museum and the covered walkway which connects it to the Queens House and looked up at Greenwich Park and sketched the Royal Observatory on top of the hill - which is where the Prime Meridian lies - hence the title 'Very nearly sitting on Zero'. For anybody not familiar with the Prime Meridian this is the meridian (line of longitude) at which longitude is defined to be 0°. Every place on Earth is measured in terms of its distance east or west from the Greenwich Meridan. The line itself divides the eastern and western hemispheres of the Earth, just as the Equator divides the northern and southern hemispheres. I keep having a go at trying to work out exactly where the meridian goes and whether or not my home lies on it too. For a long time I rather suspected my home was just off it and that it actually runs through the site of the Olympics in 2012 to the east of me. This time when I got back I checked it on Google Earth and I was right. It runs north from the Observatory - to the right of the Isle of Dogs (where Canary Wharf is) - just to the left of the former Millennium Dome/O2 Arena and then goes straight up the site of the 2012 Olympics and exits from land through Hull! The really weird thing is that it crosses straight through the southern entrance/exit to the Blackwall Tunnel - and I never knew all these years that I've been driving back and to through it! The Maritime galleries deal with Britain's encounter with the world at sea from the 16th to the early 20th centuries. I hadn't been to the Maritime Museum for very many years and always remembered it as being very boring. However it's now apparently a top attraction for families after a transformation. 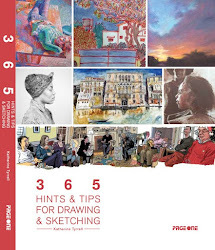 "He who must not be bored while I sketch" found it really interesting whereas I now rate it as 'quite interesting' - given this is essentially "boy's toys" stuff! We only scraped the surface of what is there but the bit I liked the best of what we saw was the display about the London Docks - then and now - in Maritime London. It was also rather amazing to be able to see, in Nelson's Navy, the uniform that Nelson was wearing when he received the fatal shot which killed him at Trafalgar in 1805 - complete with bullet hole. What was even more amazing was to see drawings, etchings and paintings of the absolutely amazing riverboat procession of Nelson's body from Greenwich up to London for burial. I thought the maritime paintings were quite weak however I was able to see some of Whistler's Etchings from his Thames series - which I've only seen on the Internet before (see Making a Mark: Whistler Month: The Thames Set, Etching Papers and watermarks). The interesting thing about the etchings was how small they were - I'd no idea and had somehow always assumed that they were much bigger. You can see all the galleries here - we only scratched the surface. 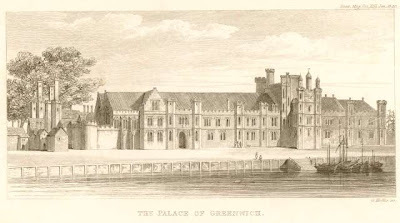 A sketch of Greenwich Palace in England published in the Gentlemen's Magazine in 1840. We also discovered that the site at the edge of the river is the place where the Palace of Placentia used to be. You can read about it in the Tudors and Stuarts and Greenwich Fact Files. The Palace of Placentia was an English Royal Palace built in 1447, in Greenwich, right next to the River Thames. The Palace was then demolished in the seventeenth century and replaced with the Greenwich Hospital in the late seventeenth century (which then became the The Royal Naval College and now Greenwich University) . 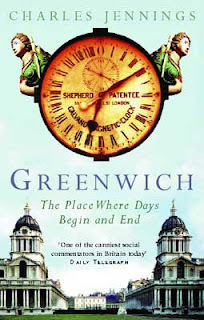 I've now got a new 'old' paperback called Greenwich - the place where days begin and end by Charles Jennings and will be reading up about all the things that went on there. It's got some very good reviews and I'm quite sure it's going to tell me things which I never knew before - here's just a few of the ones I found out on Friday. Henry VIII used to spend a lot of time there - jousting in the tilting yards and visiting the Royal Dockyards which were not far away at Deptford. Elizabeth I used to like spending the summer at Greenwich. 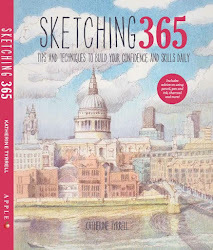 I'm going to do some more reading and then I think I might do a series of sketches of Greenwich. Katherine, I've just spend a delightful 20 minutes catching up with you here. 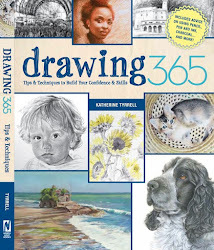 The Greenwich series sounds very interesing and a nice blend of the artful and the intellectual. 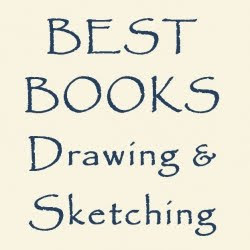 As usual, your recent sketches are lively and filled with light. Which art sold at the Summer Exhibition?